(Nanowerk News) Researchers working within Pacific Northwest National Laboratory's (PNNL's) Separations Science program succeeded in coupling a highly controlled way of modifying surfaces, called ion soft landing, with a PNNL-designed and built electrochemical cell to achieve precise control over the chemical composition of complex interfaces. Once achieved, this allowed them to make atom-by-atom changes to electrodes to study the effect on performance and stability. The experiments, combined with theoretical calculations by collaborators in Spain, were published in an ACS Nano article ("Controlling the Activity and Stability of Electrochemical Interfaces Using Atom-by-Atom Metal Substitution of Redox Species"). 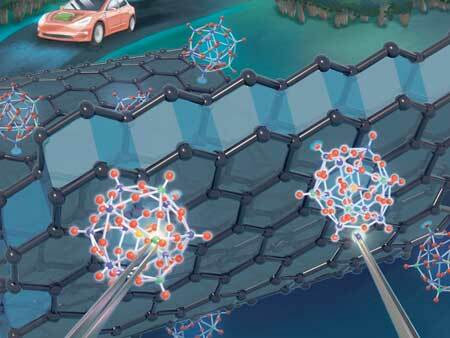 They revealed that substitution of only one to three tungsten atoms by molybdenum atoms in complex metal-atom clusters resulted in a pronounced improvement in their electronic behavior, which controls how efficiently these species accept electrons for separation applications. In electrochemical devices used for separations, the interfaces are complex. A lot is going on at once as electroactive ions, solvent molecules, and supporting electrolytes interact, exchanging electrons and mass during charge transfer processes. To understand these processes, it is necessary to decouple the different charge transfer and ionic interactions occurring on electrodes. In this study, the researchers did just that, and further, exerted control over the process by tuning electrodes at the atomic level.